London's King's Cross used to have a rough, sleazy reputation in much the same way its Sydney namesake has had. It wasn't the kind of place you'd take your mum for lunch. But you would now because it's one of the British capital's most improved districts, flush with sleek 21st century developments and rejuvenated heritage landmarks, buzzing with Londoners and tourists alike who come here to eat, drink, shop and hang out. 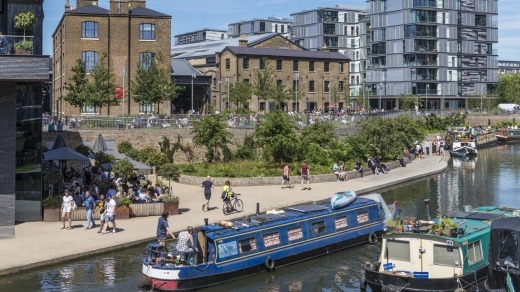 It might shock those who were acquainted with King's Cross in the dark, dingy not-too-distant past, but it's also become quite a desirable place to live. 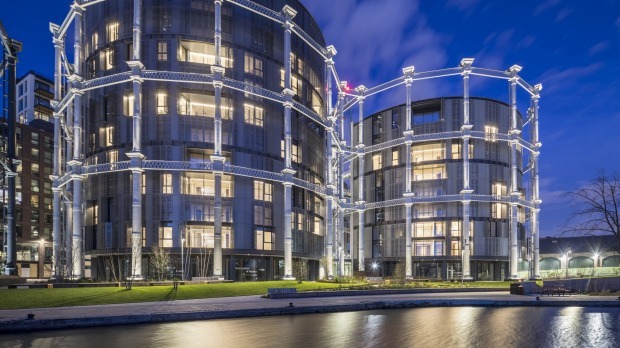 New one-bedroom apartments set in the frames of the area's restored Victorian "gasholders" sell for between $1 million and $2 million. You see them, and the area's other dramatic changes, by strolling north of two grand neighbouring railway terminals, St Pancras and King's Cross. Exit either station and shiny contemporary architecture and revived Victorian gems vie for your attention along Battle Bridge Place, a paved pedestrian thoroughfare. Legend has it that this area was the site of a major battle in AD60 between the Romans and the Iceni Celtic tribe led by Queen Boudica. A stone's throw from St Pancras's Eurostar check-in, German Gymnasium brings a flavour of continental Europe to NC1, the new postcode of this pocket of north-central London. With high ceilings and decadent furnishings, this gorgeous venue sprawls across England's first purpose-built gymnasium, which was funded by the German community in 19th century London. Now, under German-born executive chef, Bjoern Wassmuth, it serves Mittel-European favourites such as pork knuckle with sauerkraut and potato dumpling and Siberian caviar in its all-day Grand Cafe, restaurant and Meister Bar. There's a heated terrace that morphs into a gregarious sun trap on fine-weather days, as crowds mingle over cocktails and Black Forest beers. Wine-lovers should pop round the corner to Vinoteca, a bright, glass-fronted establishment run by Brett Woonton and Charlie Young, both of whom have worked in the Australian wine trade. Inspired by the wine bars of Spain and Italy, Vinoteca has a selection of 25 wines by the glass and many more by the bottle. Pair your tipples with bar snacks and charcuterie, or dishes such as red wine-braised Oxfordshire pork cheeks with celeriac puree. You can breakfast and brunch at Vinoteca, too, but if you're after home comforts, and the likes of jasmine hot-tea smoked salmon, poached eggs, greens, furikake, avocado and cherry tomatoes, try its Pancras Square neighbour Granger & Co. This all-day eatery from Australian chef Bill Granger may also lure you back later with choices like sticky chilli belly pork, roast peanuts and spring onion salad. Korean grill restaurant Kimchee and Drake and Morgan (which offers, among other treats, afternoon tea) nestle further up Pancras Square, which is carpeted with terraced water features, trees and outdoor seating areas. It's framed by high-rise office blocks. Google is among the big-name companies doing business here. The tech giant is building its new £1 billion UK headquarters in King's Cross. It is dubbed a "groundscraper" because, at 330 metres in length, it'll be longer than The Shard, London's highest building, is tall. A rooftop garden will be just one of its wow factors. Walk east of Pancras Square, up King's Boulevard, to Regent's Canal, a 19th century waterway that snakes 14 kilometres across north London. Cross the bridge over the canal and you'll be on Granary Square, a vast space, similar in size to Trafalgar Square. In Victorian times, the square was a canal basin, where barges would unload goods. It's still a hive of activity, with a year-round program of events, performances, markets and festivals. On sunny days, children splash about in the square's choreographed fountains which light up after dark, and you might see students napping on the benches. One of the occupants of the converted 1850s brick grain store lording over Granary Square is Central Saint Martins, the arts and design college that counts Alexander McQueen, Stella McCartney and Britpop's Jarvis Cocker among its alumni. Cocker famously referenced the college in Pulp's Common People, and art shows and gallery exhibitions are regularly staged here. Next door is the swish Granary Square Brasserie, which offers British and international dishes and the neighbourhood's largest al fresco terrace, and Caravan, a Kiwi-founded cafe, roastery and restaurant sporting industrial-chic decor. 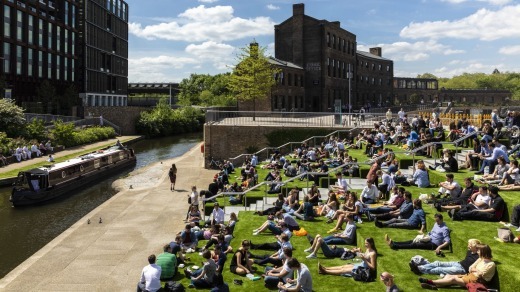 Whenever I'm in King's Cross, I like to grab a take-away flat white from Caravan and sip it on the artificial grass steps that tumble down to the canal. It's usually rather idyllic with colourfully-painted narrow-boats and ducks drifting by, and walkers and joggers pounding the towpath. Canal views and upmarket gastropub food can be had at The Lighterman, a waterfront affair set across three floors. Its name is inspired by those Victorian-era workers who plied the canals and rivers on flat-bottomed barges, known as "lighters". The King's Cross revamp has evolved over two decades, reviving about 27 hectares of formerly derelict or shabby landscapes, and its latest addition is another eye-catching spectacle that pays homage to the past. Just west of Granary Square, Coal Drops Yard touts itself as "a place where art, commerce and culture come together". It was here, centuries ago, wagons would drop millions of tonnes of northern English-mined coal which was loaded on to horse-drawn carts and carried across London to power the city. Now, amid a neat fusion of brick arches, cobblestones, vibrant logos and modern architecture (notably a curving roof by architect Thomas Heatherwick), people browse and stroll in a new quarter that is home to 60 or so high-end outlets, both renowned and up-and-coming. As well as a funky boutique for homeless charity, Shelter, there are stores by top designers Tom Dixon and Paul Smith, a chocolate shop by Alain Ducasse and a branch of Michelin-starred Spanish tapas restaurant, Barrafina. King's Cross has long been a neighbourhood of temptations, and while some visitors can't resist The Harry Potter Shop At Platform 9¾ at King's Cross station, my biggest vice is Dishoom. Facing Coal Drops Yard on Stable Street, it's a stylish modern twist on the old Irani (Iranian-style) cafes of Mumbai. The setting – a converted railway transit shed, with whirring ceiling fans, marble-topped bars and a replica of the clock from Mumbai's Chhatrapati Shivaji Maharaj Terminus – is magnificent. And, whether you have, say, bacon and egg naan roll for breakfast or fragrant lamb biryani for dinner, the food is rarely less than delicious. At peak times there's usually a queue for Dishoom but it moves quickly and staff ply you with glasses of soothing masala chai as you wait. Steve McKenna travelled at his own expense.